There is little doubt that the lowly and often derided programing language BASIC did more to advance the accessibility of computers to regular folks than almost anything else I can think of. It was today in 1964 that the first version of BASIC came into being. As I was only nine years old at the time I only had the vaguest idea about what a computer was, never mind how to program one. But they sounded neat! They sounded so neat that 9 years later I became a computer geek. Oh it was nothing glamorous, feeding paper in to voracious printers, hanging tapes on spindles, and lugging heavy disks around from drive to drive. Night shifts were long and mostly boring. I would spend happy hours at the 029 punch card machine banging out a small program in Fortran. The problem was that it took ages for the huge IBM 360 to get around to my silly deck of cards, and when it did, ages more for the paper gobbling beast of a printer to spit out a bunch of green bar fanfold paper telling me I had a syntax error! So began my discovery of BASIC. I was not called BASIC, it was HUW (Harwell Users Workshop). HUW lived in a mighty PDP 8 and was lord over a bunch of ASR 33 teletypes. HUW was the brainchild of one of our mad scientists. In retrospect I see that he had based his idea on BASIC. The command set was more complex, but the basic premise was the same. Best of all, results were almost instantaneous. Several years ago I saw an ASR 33 languishing in a garden, my wife threatened divorce if I knocked on the door!! In the early 80’s the world really took notice of BASIC with the release of the IBM PC. The less pricey Vic 20 made BASIC even more approachable to the man in the street. BASIC certainly has its limitations, it is far from bullet proof, but no language truly is. It was cheap and cheerful. You could get the rudiments in just a couple of hours. 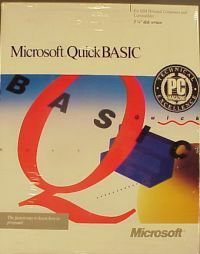 By the 90’s BASIC was even found at the center of commercial products. There were more flavors of BASIC than breakfast cereal. Sure it lead to unmanageable code, and maybe it was never designed for serious developers, but it was a pile of fun to use. Looking back at the many versions I have used, my favorite has to be QB 4.5. I do not praise Microsoft often, but this was a killer implementation of the language. I used it to create terminal emulators for mini computers, and even a performance monitor for a set of IBM products. Happy 50th birthday BASIC. You have done great things to inspire young people to learn about computers. It almost makes me want my old Vic 20 back! It did not take long to bring the beast to its knees. Oh how I miss the golden age of computing. No user commented in " BASIC Turns 50 "